Two basic styles are available. 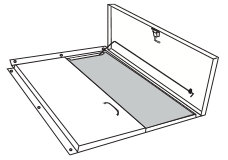 The Replacement Door (RD) is a flat unit for an existing sloped wall. 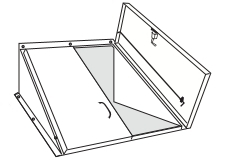 The Cellar Door (CD) is a sloped unit for a flat surface. Click the model that suits your needs. Already measured your existing steel unit? Use the following chart to find the appropriate model. Please note when replacing a different manufacturers unit that the footprint of the unit will not be the exact same as the footprint of the Gordon Door. However, the Gordon Door will sit on the foundation. Complete details for integrating our cellar doors into your next project.